Tags: Florida, Governor, Rick Scott, CNN, State of the Union To share or post to your site, click on "Post Link". Please mention / link to America's Best Choice. Thanks! Posted by Bill Smith : Post Link --> 4:58 PM 0 Comments - Share Yours! 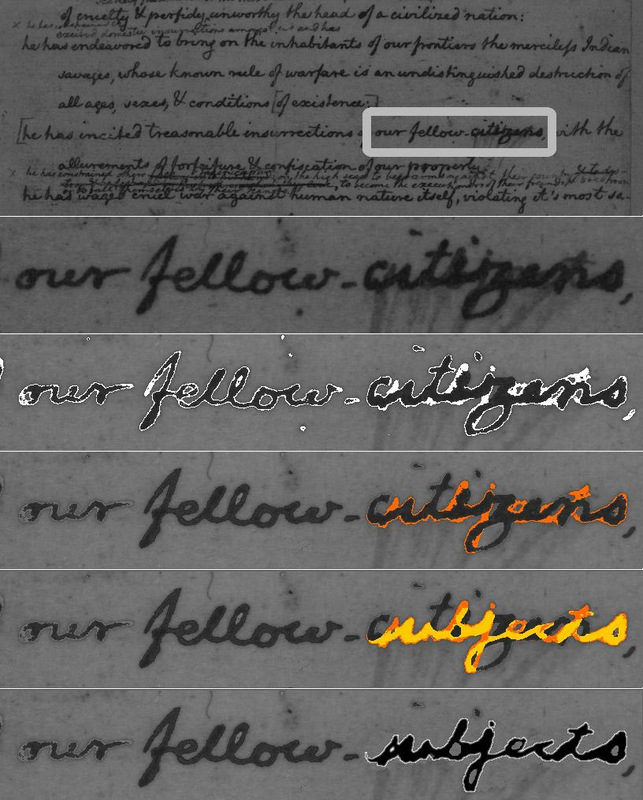 Tags: Ken Blackwell, Bob Morrison, Citizens or Subjects, citizes, United States, Jefferson, Declaration of Independence, SCOTUS, Supreme Court, Federal health care, individual mandate, mandate, Obamacare, forcing people to buy products, to pay to be citizens, liberty, freedom To share or post to your site, click on "Post Link". Please mention / link to America's Best Choice. Thanks! 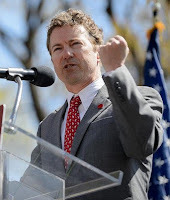 Tim Phillips, President, Americans For Prosperity: On Tuesday, I looked out at the thousands upon thousands of faces and the sea of “Hands Off My Health Care” and “I Am AFP” signs, and I knew our movement was stronger than ever! Your voices, the voices of the American people, were heard over the pundits and politicians from both sides of the aisle. According to one speaker, our voices “rattled the windows of the Supreme Court.” Together, we sent a crystal clear message to the Supreme Court: do the right thing...overturn this disastrous, unconstitutional government takeover of our health care. 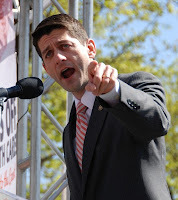 From our event, a CNN correspondent reported to Wolf Blitzer, “I want to give you a sense of what the crowd looks like here; it goes on and on and on!” Click here to see photos of the rally! Over 4,000 activists joined Americans for Prosperity and our 20+ coalition groups for the incredible Hands Off My Health Care Rally across the street from the U.S. Supreme Court. We heard from great speakers like Sen. Rand Paul, Sen. Jim DeMint, Sen. Ron Johnson, Sen. Pat Toomey, Rep. Michele Bachmann, Rep. Paul Ryan, and Rep. Alan West. We heard from breast cancer survivor, Tracy Walsh, who told her personal story of survival due in part to choices and access provided by our health care system. We heard from Canadian, Shona Holmes, who told how she faced waiting lists and denied treatments for her brain tumor in her home country thanks to their socialized health care system but thankfully she drove south to the United States for the treatments that saved her life. This fight is far from over, but our fellow Americans are with us. Every poll shows they want to see the health care takeover law repealed. But we've got to keep taking our message of freedom to the American people. If you have not done so already, make your voice heard by signing AFP's Statement to the Court. We displayed the many thousands of signatures we've collected so far at the Rally, and we're continuing to gather more! Be sure to forward this message to your friends and family, and ask them to sign AFP's Statement to the Court. We can't let up now. We have to keep pushing hard, and make sure that the President's health care takeover is struck down in its entirety. Until that day comes, Americans for Prosperity will keep fighting with help from activists like you. Americans for Prosperity® (AFP) is a nationwide organization of citizen leaders committed to advancing every individual's right to economic freedom and opportunity. AFP believes reducing the size and scope of government is the best safeguard to ensuring individual productivity and prosperity for all Americans. AFP educates and engages citizens in support of restraining state and federal government growth, and returning government to its constitutional limits. AFP has more than 1,900,000 members, including members in all 50 states, and 34 state chapters and affiliates. Posted by Bill Smith : Post Link --> 9:47 AM 0 Comments - Share Yours! WASHINGTON - Republican Sen. Marco Rubio of Florida endorsed Mitt Romney as the party's presidential nominee Wednesday night, saying it's increasingly clear that Romney will win the nomination and that continuing the primary fight will only damage the effort to defeat President Barack Obama. Tags: Florida, Marco Rubio, endorsement, Mitt Romney To share or post to your site, click on "Post Link". Please mention / link to America's Best Choice. Thanks! Intro: Jim Crow laws were state and local laws in the United States enacted between 1876 and 1965 by Democrats to stop or hinder people of color from voting. It was Republicans that led the efforts for the emancipation and freedom of African Americans and who pushed through Congress Civil Rights legislation protecting the right to vote and to have equal access with all other American citizens to all avenues of life in the United States. However, the Democrats after committing these discriminatory and evil actions have co-opted the message and continued their lies. The following articles from Real Clear Politics evidences the brazenness of Debbie Wasserman-Schultz in her deceptive use the term Jim Crow laws. It evidences how she is truly the DNC progressive propagandist who seeks to continue the deceptive coverup of truth. 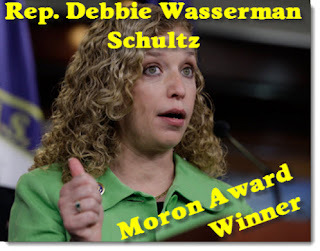 While beauty is in the eyes of the beholder, lies and deceptions come forth from the heart of the "moron award winner." Real Clear Politics: When asked about her comment that the GOP is trying to bring America back to the days of Jim Crow, DNC Chairwoman Debbie Wasserman-Schultz insists "that's not what I said." However, in an appearance on "Washington Watch," she said that Republicans "want to literally drag us all the way back to Jim Crow laws" by passing voter ID requirements. "[I]f you go back to the year 2000, when we had an obvious disaster and - and saw that our voting process needed refinement, and we did that in the America Votes Act and made sure that we could iron out those kinks, now you have the Republicans, who want to literally drag us all the way back to Jim Crow laws and literally - and very transparently - block access to the polls to voters who are more likely to vote Democratic candidates than Republican candidates. And it's nothing short of that blatant," DNC Chair Rep. Debbie Wasserman Schultz (FL) told TVOne's "Washington Week." Tags: Florida, U.S. Representative, Debbie Wasserman-Schultz, DNC Chair, democrat, attacks republicans, mention's Jim Crow laws To share or post to your site, click on "Post Link". Please mention / link to America's Best Choice. Thanks! Posted by Bill Smith : Post Link --> 3:13 PM 1 Comments - Share Yours! NRSC Video: Two years of Obamacare. 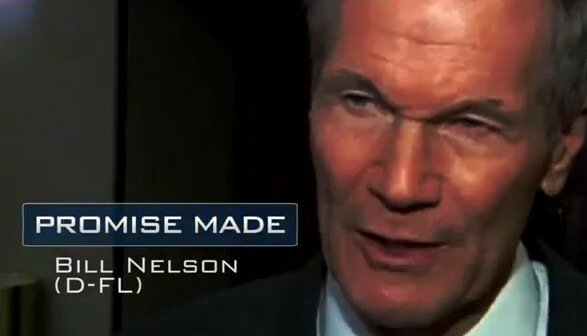 Senate Democrats like Sen. Bill Nelson (D-FL) promised it would lower costs, lower premiums, cover everyone, and protect Medicare. Instead? Twice the cost, higher premiums, 23 million people left out, and $500 billion cut from Medicare. Tags: Obamacare, broken promises, Two Years, Anniversary, Health Care Reform, Harry Reid, Ben Nelson, Medicare, Cost, CBO, Spending To share or post to your site, click on "Post Link". Please mention / link to America's Best Choice. Thanks! Posted by Bill Smith : Post Link --> 9:19 AM 0 Comments - Share Yours! Friday March 23, unless otherwise noted. The Nationwide Rally for Religious Freedom will be a peaceful, family-friendly, non-partisan, ecumenical event. For more information, please see the Rally Guidelines and Protocols, below. Cities in the following 44 states and the District of Columbia will be participating: Alabama, Alaska, Arizona, California, Colorado, Connecticut, Florida, Georgia, Hawaii, Idaho, Illinois, Indiana, Iowa, Kansas, Kentucky, Louisiana, Maine, Maryland, Massachusetts, Michigan, Minnesota, Mississippi, Missouri, Nebraska, Nevada, New Hampshire, New Jersey, New Mexico, New York, North Carolina, North Dakota, Ohio, Oklahoma, Oregon, Pennsylvania, Rhode Island, South Carolina, South Dakota, Tennessee, Texas, Utah, Virginia, Washington, Wisconsin. Where are the people of Arkansas, Delaware, Montana, Vermont, West Virginia, Wyoming? Tags: Nationwide Rally, Stand Up, Religious Freedom, pro-life, States Boston Massachusetts, To share or post to your site, click on "Post Link". Please mention / link to America's Best Choice. Thanks! H/T Weasel Zippers: The creepy Obama worship takes a turn for the worse. Bradford, an organizer with the Veterans Memorial at Fountain Park in Leesburg, Fla., snapped photos of the flag and distributed them to fellow veterans and friends. By late afternoon, he and several other veterans delivered a copy of the federal flag code to Nancy Hurlbert, chairwoman of the Lake County Democratic Party. 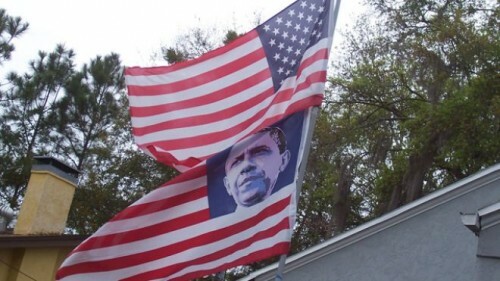 Tags: Florida, Lake County, democratic party, Obama Flag, To share or post to your site, click on "Post Link". Please mention / link to America's Best Choice. Thanks! Posted by Bill Smith : Post Link --> 6:49 PM 0 Comments - Share Yours! Tags: Florida, Rasmussen Reports, US. Senate, 2012 election, Connie Mack, Ben Nelson, George LeMieux, Mike McCalister To share or post to your site, click on "Post Link". Please mention / link to America's Best Choice. Thanks! Posted by Bill Smith : Post Link --> 10:30 AM 0 Comments - Share Yours! A native of Venezuela, Sgt. Quintana immigrated to the United States in 1992 months after a failed coup d'état by then lieutenant colonel Hugo Chavez, who now presides over Venezuela. “All Americans need to wake up to the reality that the only reason our nation has not totally gone in the ways of leftist-ruled countries like Venezuela, Bolivia and Nicaragua—to name a few—has been due to our Charters of Freedom; the Declaration of Independence, our Constitution and Bill of Rights is what sets us apart from any other nation on the face of the earth and we must ensure they are upheld and preserved; this is why I launched Changeitback2012.com”, Sgt. Quintana said. 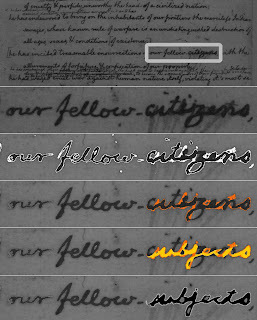 Changeitback2012.com’s 1 million American eligible voters will wear a CIB2012 shirt that will bear a custom Voter # ranging from 1 to 1 million as a visible show of strength and unity in numbers that will create community engagements and ultimately serve as a declaration on Election Day for all to see that the will and power of the American people is still alive. “I need the support of every conservative and patriot for this initiative to be successful”. 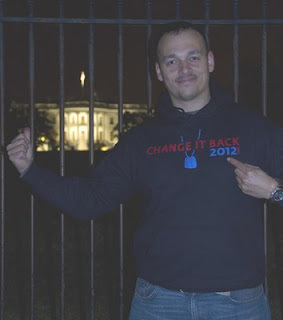 You can do this by joining the 1 Million force and being counted with your own CIB2012 Voter shirt, and/or by donating to Changeitback2012.com’s “Donate” page; this will help fund the trek around the country. It would be ironic—or worse yet—it would be as if I had come here in vain to have the United States of America turn like the country I left and I’m not willing to pass down such a country to my own daughter.” Sgt. Quintana declared. Posted by Bill Smith : Post Link --> 7:23 PM 1 Comments - Share Yours! Tags: Florida, pension ruling, judge, To share or post to your site, click on "Post Link". Please mention / link to America's Best Choice. Thanks! Posted by Bill Smith : Post Link --> 4:50 PM 1 Comments - Share Yours! 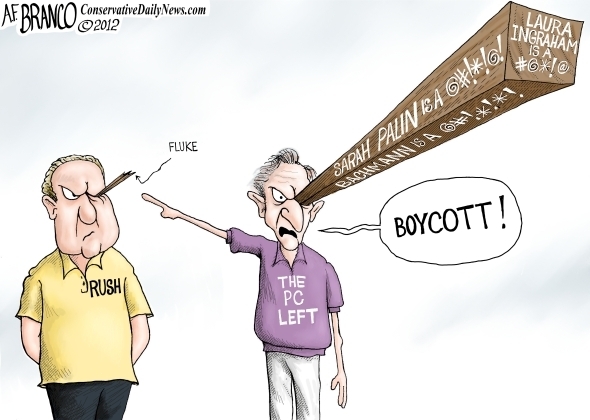 Tags: Tony Branco, political cartoon, Rush Limbaugh, liberal left, Matthew 7:3, Bible To share or post to your site, click on "Post Link". Please mention / link to America's Best Choice. Thanks! Posted by Bill Smith : Post Link --> 6:29 PM 0 Comments - Share Yours! 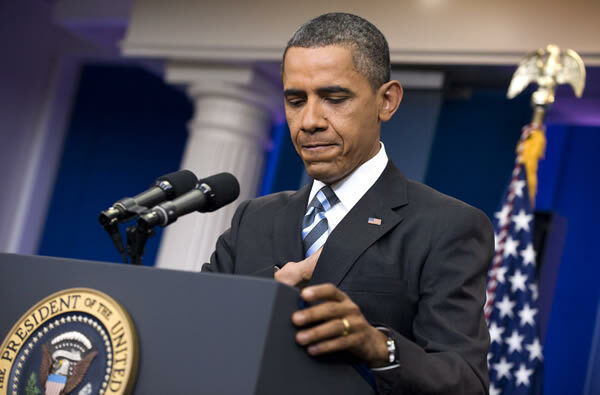 Tags: Barack Obama, Press Conference, 10 questions, questions To share or post to your site, click on "Post Link". Please mention / link to America's Best Choice. Thanks! Posted by Bill Smith : Post Link --> 8:24 PM 0 Comments - Share Yours! by Sean Hackbarth, Free Enterprise: The President delivered another energy speech today, and populism trumped sound economics. Along with taking undeserved credit for expanding oil and gas production (more on that in a bit), the President told Congress they should vote “in the next few weeks” to raise taxes on oil and gas companies. Raising taxes will improve energy security? Economic analysis doesn’t say so. Cost 170,000 jobs through 2014. Result in up to $128 Billion in lost government revenue through 2025. Cause a 14% decrease in energy production on federal lands that would have to be replaced with imported energy. 500,000 new jobs would be created by 2025. $480 billion in additional government revenue would fill federal coffers. History also tells us higher energy taxes is bad policy. In 1980, a windfall profits tax was slapped on domestic oil production. As noted in an Institute for 21st Century Energy report, the Congressional Research Service estimated that the tax reduced domestic production by 8% and increased imports by as much as 13%. These studies affirm the common sense claim that when you raise taxes on energy companies you end up with less domestic energy and jobs, but when you reduce their burdens you get more energy and jobs. Now back to the President continuing to push the farce that his administration should be praised for increased domestic oil and gas production. On stage in New Hampshire, he stood beside a chart touting the reduction in oil imports while he has been President. But the federal government can only take credit (or blame) for any change in energy production on land it controls--federal lands. They can’t take credit for increases in energy development from state and private lands. It’d be like a potato farmer taking credit for more potatoes grown in total even though all the increase is from his neighbor’s farm. 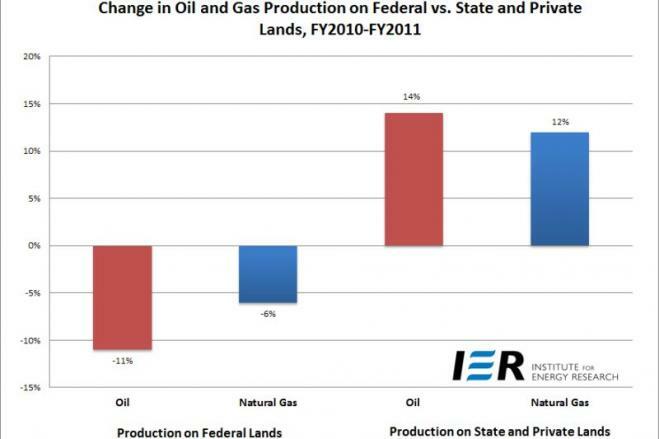 The Institute for Energy Research pieced together Department of Interior data and found that oil and gas production on federal lands decreased from 2010-2011, while oil and gas production on state and private lands increased. [See the chart above.] Also, Mark Green at Energy Tomorrow notes, “According to EIA [Energy Information Administration], Gulf production was down from 1.55 million barrels per day in 2010 to 1.32 mb/d in 2011 and is estimated to fall to 1.23 mb/d in 2012 – the 21 percent decline.” This is what the administration should claim as their own. Despite what the President says on the stump, the facts are that higher energy taxes will reduce domestic production and cost jobs, and oil and gas development is decreasing under his administration. Last time I checked an “All-of-the-Above” energy strategy would include all kinds of energy—renewables, nuclear, and oil and gas. The President should actually mean what he says instead of pushing policies that run counter to his rhetoric. Tags: Sean Hackbarth, Free Enterprise, U.S. Chamber of Commerce, Energy Security, energy taxes, President Obama, Obama's rhetoric, EIA, Energy Information Administration To share or post to your site, click on "Post Link". Please mention / link to America's Best Choice. Thanks! Bankrupting America: Each time Americans get a paycheck, a portion of it is siphoned off to fund the government. Most have just come to accept this as an unfortunate reality. But do you ever wonder where that money is actually going? 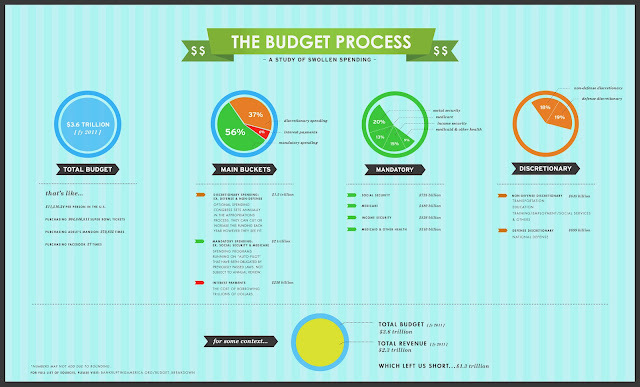 Our latest infographic looks at where your tax dollars were spent in 2011, and breaks them down into easy to understand diagrams. From the big-ticket items, to the relatively small expenditures and everything in between, we show just where your tax dollars end up. As the House and Senate debate the President’s budget, let’s take a step back from the rhetoric and look at the facts. For the government’s last fiscal year, which ended on September 31, 2011, we break down spending into easy to understand diagrams and give you some real world examples of what you could buy with $3.6 trillion dollars. That is if you are ok with being $1.3 trillion dollars in debt. View our fact sheet on last fiscal year’s spending. Tags: Bankrupting America, Congress, debt, deficit, Fiscal Year 2011, house of representatives, Senate, spending, wasteful spending To share or post to your site, click on "Post Link". Please mention / link to America's Best Choice. Thanks! 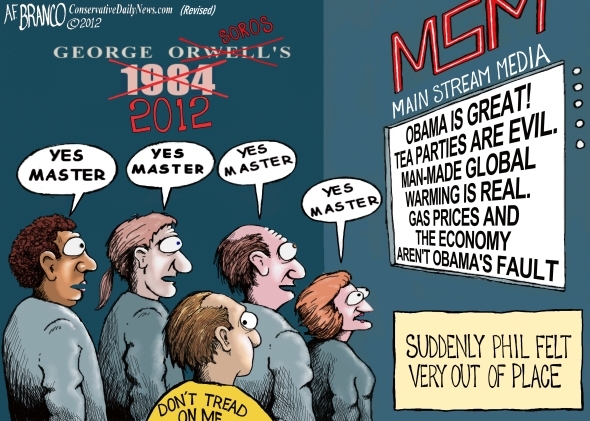 Tags: 1984-2012, 1984, George Orwell, 2012, George Soros, MSM, media, indoctrination, AF Branco, political cartoon To share or post to your site, click on "Post Link". Please mention / link to America's Best Choice. Thanks! Posted by Bill Smith : Post Link --> 10:16 AM 0 Comments - Share Yours! Dr. Bill Smith, Editor: While the present administration discouraged and made excuses for not opening American's Resources which would benefit Americans and the American economy, it has also practiced class warfare and has undertaken efforts to demean, excessively regulate, and even punish businesses and various industries that are "an asset to U.S. economic growth" and benefit greatly to the American economy. They have also invested our dollars and borrowed debt in failing business ventures rather than allowing the free market to work without government interference. Now, consider the fact that this administration is also using the income created by taxes, duties and royalties paid by businesses, industry and individuals taxpayers to carry out efforts that demean, interfere, and over regulate the very people, businesses and industries that are paying the Government's bills with real not borrowed dollars. 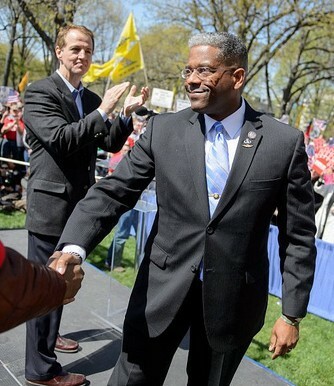 The present administration pushes negative and destructive agendas ("false flags") which pit people and groups against each other while tearing at the fabric of commerce and our economy which has bolstered the lives of the American people as a whole. 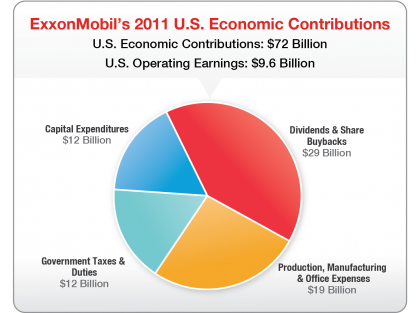 I am pleased to see ExxonMobil sharing with the public their contribution to the U.S. economy. I think you will find the facts impressive. Please share the following with others. Ken Cohen, ExxonMobil Perspectives: Some in Washington would have you believe that because companies like ExxonMobil are profitable, we are “taking from” the U.S. economy, rather than contributing to it. But the facts prove otherwise. Last year, while ExxonMobil’s operating earnings in the U.S. were $9.6 billion, our total contribution to the U.S. economy was $72 billion. That is how much ExxonMobil spent in the United States on things like taxes, salaries, returns to our investors and money paid to other businesses and industries to keep our U.S. operations running. In other words, for every dollar we earned in the U.S., we contributed seven more dollars to the U.S. economy – to both governments and individual Americans. $29 billion to our investors in the form of dividends and share buybacks. Investors of oil and gas companies include teachers, government workers and other public pension holders, as well as the millions of Americans who invest in IRAs or mutual funds. $19 billion in goods and services related to running our U.S. production, manufacturing and office facilities, including payroll to our more than 30,000 U.S. employees. $12 billion in capital spending, which goes to contractors, construction companies, raw materials and other spending on goods and services related to our U.S. oil, natural gas and chemicals activities. 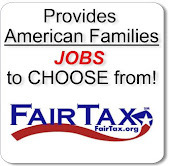 $12 billion to the U.S. government (local, state and federal) in the form of taxes and duties. All told, that’s $72 billion that governments can use to fund vital services, companies can use to hire workers, and investors can use to save for retirement. Let me put ExxonMobil’s economic contribution into perspective: $72 billion is roughly equal to the total federal income taxes paid by all the residents of Ohio, Virginia and North Carolina combined, according to the latest data available from the IRS. It is slightly more than the total annual operating revenue of the U.S. Postal Service. And that $72 billion is just ExxonMobil’s contribution. When you consider the fact that ExxonMobil accounts for only about 5 percent of total U.S. oil and natural gas production, you can get a sense of the scale of the economy-wide contribution made by America’s oil and gas industry. This money creates a ripple effect of economic activity that allows other people, industries and governments to spend, hire and invest. Why am I making this point? Because right now the United States is engaged in a discussion about how to strengthen its balance sheet, and to be successful we will need to know the difference between our assets and our liabilities. Just like other successful American companies, ExxonMobil is an asset to U.S. economic growth. Tags: ExxonMobil. Contribution, Contribution to U.S. Economy, economy, the economy, Energy and the Economy, Tax Policy, dividends to investors, goods and services purchased, purchases, capital spending, U.S. taxes and duties, business, industry To share or post to your site, click on "Post Link". Please mention / link to America's Best Choice. Thanks! Posted by Bill Smith : Post Link --> 11:11 AM 0 Comments - Share Yours!